"Republic of Salò" redirects here. It is not to be confused with Republic of Salé. "For the honour of Italy"
In July 1943, after the Allies had pushed Italy out of North Africa and subsequently invaded Sicily, the Grand Fascist Council—with the support of King Victor Emmanuel III—overthrew and arrested Mussolini. The new government began secret peace negotiations with the Allied powers. When the Armistice of Cassibile was announced 8 September, Germany was prepared and quickly intervened. Germany seized control of the northern half of Italy, freed Mussolini and brought him to the German-occupied area to establish a satellite regime. The Italian Social Republic was proclaimed on 23 September 1943. [page needed] Although the RSI claimed sovereignty over most of Italian territory, its de facto jurisdiction only extended to a vastly reduced portion of Italy. The RSI received diplomatic recognition from only Germany, Japan and their puppet states. On 24 July 1943, after the Allied landings in Sicily on a motion by Dino Grandi the Grand Fascist Council voted a motion of no confidence in Mussolini. Mussolini's position had been undermined by a series of military defeats from the start of Italy's entry into the war in June 1940, including the bombing of Rome, the loss of the African colonies and the Allied invasions of Sicily and the southern Italian Peninsula. The next day, King Victor Emmanuel III dismissed Mussolini from office and ordered him arrested. By this time, the monarchy, a number of Fascist government members and the general Italian population had grown tired of the futile war effort which had driven Italy into subordination and subjugation under Nazi Germany. The failed war effort left Mussolini humiliated at home and abroad as a "sawdust Caesar". Under Marshal Pietro Badoglio, the new government began secret negotiations with the Allied powers and made preparations for the capitulation of Italy. These surrender talks implied a commitment from Badoglio not only to leave the Axis alliance but also to have Italy declare war on Germany. On 8 September, Badoglio announced Italy's armistice with the Allies (although termed an "armistice", its terms made it akin to an unconditional surrender). German Führer Adolf Hitler and his staff, long aware of the negotiations, acted immediately by ordering German troops to seize control of Northern and Central Italy. The Germans disarmed the Italian troops and took over all of the Italian Army's materials and equipment. 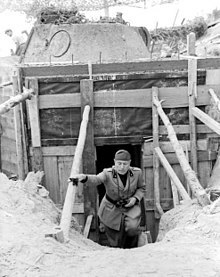 The Germans also dissolved the Italian occupation zone in southeastern France and forced Italian troops stationed there to leave. The Italian armed forces were not given clear orders to resist the Germans following the armistice and so resistance to the German takeover was scattered and of little effect. King Victor Emmanuel made no effort to rally resistance to the Germans, instead of fleeing with his retinue to the safety of the Allied lines. The new Italian government had moved Mussolini from place to place while he was in captivity in an attempt to foil any attempts at rescue. Despite this, the Germans eventually pinpointed Mussolini at the Campo Imperatore Hotel at Gran Sasso. On 12 September, Mussolini was liberated by the Germans in Operation Eiche in the mountains of Abruzzo, while the Italian carabinieri were allegedly placed under orders to not fire their weapons at the raiders, rendering them defenseless. After being liberated, Mussolini was flown to Bavaria. Gathering what support he still had among the Italian population, his liberation made it possible for a new German-dependent Fascist Italian state to be created. 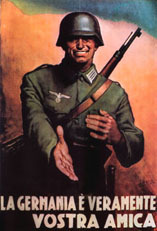 Italian Social Republic propaganda poster saying: "Germany is truly your friend"
The Italian Social Republic was proclaimed on 23 September, with Mussolini as both head of state and prime minister. [page needed] The RSI claimed Rome as its capital, but the de facto capital became the small town of Salò on Lake Garda, midway between Milan and Venice, where Mussolini resided along with the foreign office of the RSI. While Rome itself was still under Axis control at the time, given the city's proximity to Allied lines and the threat of civil unrest, neither the Germans nor Mussolini himself wanted him to return to Rome. On 18 September, Mussolini made his first public address to the Italian people since his rescue, in which he commended the loyalty of Hitler as an ally while condemning Victor Emmanuel for betraying Italian Fascism. He declared: "It is not the regime that has betrayed the monarchy, it is the monarchy that has betrayed the regime". He also formally repudiated his previous support of the monarchy, saying: "When a monarchy fails in its duties, it loses every reason for being...The state we want to establish will be national and social in the highest sense of the word; that is, it will be Fascist, thus returning to our origins". 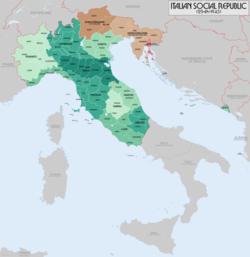 From the start, the Italian Social Republic was little more than a puppet state dependent entirely upon Germany. Mussolini himself knew this; even as he stated in public that he was in full control of the RSI, he was well aware that he was little more than the Gauleiter of Lombardy. [page needed] The RSI had no constitution or organized economy, and its financing was dependent entirely on funding from Berlin. German forces themselves had little respect for Mussolini's failed fascist movement, and saw the regime merely as a tool for maintaining order, such as repressing the Italian partisans. This work was also carried out by the infamous Pietro Koch and the Banda Koch on Germany's behalf. The RSI received diplomatic recognition from only Germany, Imperial Japan and their puppet states. Even the otherwise sympathetic Spain refused to establish formal diplomatic relations with the RSI. The RSI took revenge against the 19 members who had voted against Mussolini on the Grand Council with the Verona trial (processo di Verona) which handed down a death sentence to all of the accused but one. Only six of the 19 were in RSI custody (Giovanni Marinelli, Carlo Pareschi, Luciano Gottardi, Tullio Cianetti, Emilio De Bono and Mussolini's own son-in-law Galeazzo Ciano). They (except for Tullio Cianetti who received a life sentence) were all executed on 11 January 1944 in the fort of San Procolo in Verona. 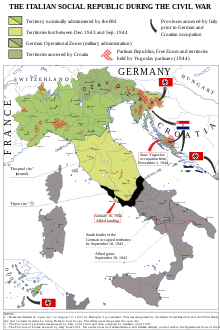 The changing political and military situation re-opened questions regarding the status of Italian territories, particularly those with German-speaking majorities that were formerly under Austrian rule. Previously, Hitler had vigorously suppressed any campaigning for the return of lands such as South Tyrol in order to maintain good relations with his Italian ally. In the aftermath of the Kingdom of Italy's abandonment of the Axis on 8 September 1943, Germany seized and de facto incorporated some Italian territories. On the other hand, Hitler refused to officially annex South Tyrol in spite of urging by local German officials and instead supported having the RSI hold official sovereignty over these territories and forbade all measures that would give the impression of official annexation of South Tyrol. However, in practice the territory of South Tyrol within the boundaries defined by Germany as Operationszone Alpenvorland that included Trento, Bolzano and Belluno were de facto incorporated into Germany's Reichsgau Tirol-Vorarlberg and administered by its Gauleiter Franz Hofer. The region identified by Germany as Operationszone Adriatisches Küstenland that included Udine, Gorizia, Trieste, Pola and Fiume were de facto incorporated into Reichsgau Kärnten and administered by its Gauleiter Friedrich Rainer. On 10 September 1943, the Independent State of Croatia (NDH) declared that the Treaties of Rome of 18 May 1941 with the Kingdom of Italy were null and void and annexed the portion of Dalmatia that had been annexed from Yugoslavia to the Kingdom of Italy in the Treaties of Rome. 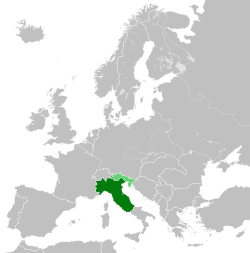 The NDH attempted to annex Zara that had been a recognized territory of Italy since 1919, but Germany did not allow the NDH to do so. Because of these actions by the NDH, the RSI held the NDH in contempt and refused to have diplomatic relations with the NDH or to recognize its territorial claims. After the Italian capitulation, the Italian Aegean Islands were occupied by the Germans (see Dodecanese campaign). During the German occupation, the islands remained under the nominal sovereignty of the RSI but were de facto subject to the German military command. During the existence of the Italian Social Republic, Mussolini, whose government had banned trade unions and strikes, began to make increasingly populist appeals to the working class. He claimed to regret many of the decisions made earlier in supporting the interests of big business and promised a new beginning if the Italian people would be willing to grant him a second chance. Mussolini claimed that he had never totally abandoned his left-wing influences, insisting he had attempted to nationalize property in 1939–1940 but had been forced to delay such action for tactical reasons related to the war. With the removal of the monarchy, Mussolini claimed the full ideology of Fascism could be pursued and to gain popular support reversed over twenty years of Fascist support of private property and relative economic independence by ordering the nationalization of all companies with over 100 employees. Mussolini even reached out to ex-communist Nicola Bombacci to help him in spreading the image that Fascism was a progressive movement. The economic policy of the RSI was given the name "Socialization" and Mussolini had even considered the idea of calling his new republic the “Italian ‘Socialist’ Republic”. In practice, little resulted from the declared socialization of the economy. Unions did not exert real control of their management and took no part in state planning (as they had the power to do on paper after the socialization). The Italian industrial sector was excluded from the new reforms by the Germans and Italian industrialists were opposed to the changes in any case. The Italian labor force (large parts of which had remained leftist despite fascist rule) regarded socialization as a sham and responded with a massive strike on 1 March 1944. 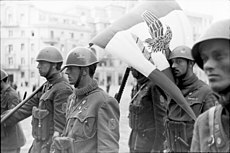 In Greece, while the government of the Kingdom of Italy surrendered and many Italian soldiers in the Aegean were tired of the war and had become opposed to Mussolini, Italian Fascist loyalists remained allied to Germany in the Greek campaign. In September 1943, General Mario Soldarelli rallied Fascist Blackshirts and Italian soldiers loyal to Mussolini to continue the war, along with military men who felt it was dishonorable to turn on an ally and with those who had developed comradely feelings toward the Germans. German forces in Greece convinced 10,000 Italians in the Aegean to continue to support their war effort. In 1944, Mussolini urged Hitler to focus on destroying Britain rather than the Soviet Union, as Mussolini claimed that it was Britain which had turned the conflict into a world war and that the British Empire must be destroyed in order for peace to come in Europe. Mussolini wanted to conduct a small offensive along the Gothic Line against the Allies with his new RSI Divisions; in December 1944, the Alpine Division "Monte Rosa" with some German battalions fought the Battle of Garfagnana with some success. As the situation became desperate with Allied forces in control of most of Italy and from February 1945 resumed to pushing the Axis forces to North of Gothic Line, Mussolini declared that "he would fight to the last Italian" and spoke of turning Milan into the "Stalingrad of Italy", where Fascism would make its last glorious fight. Despite such strong rhetoric, Mussolini considered evacuating Fascists into Switzerland, although this was opposed by Germany, which instead proposed that Mussolini and key Fascist officials be taken into exile in Germany. Further disintegration of support for his government occurred as fascist and German military officials secretly tried to negotiate a truce with Allied forces, without consulting either Mussolini or Hitler. Women volunteers served in uniform as noncombatants in paramilitary units and police formations (Servizio Ausiliario Femminile). The commander was the brigadier general Piera Gatteschi Fondelli. Smaller units like the Black Brigades (Brigate nere) led by Alessandro Pavolini and the Decima Flottiglia MAS led by Junio Valerio Borghese (called "principe nero", the Black Prince) fought for the RSI during its entire existence. The Germans were satisfied if these units were able to participate in anti-partisan activities. While varying in their effectiveness, some of these units surpassed expectations. 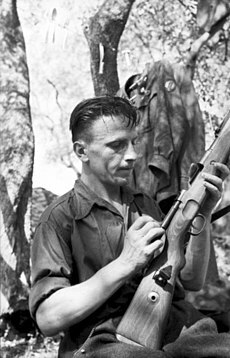 During the winter of 1944–1945, armed Italians were on both sides of the Gothic Line. On the Allied side were four Italian groups of volunteers from the old Italian army. These Italian volunteers were equipped and trained by the British. On the Axis side were four RSI divisions. Three of the RSI divisions, the 2nd Italian "Littorio" Infantry Division, the 3rd Italian "San Marco" Marine Division and the 4th Italian Monterosa Alpine Division were allocated to the LXXXXVII "Liguria" Army under Graziani and were placed to guard the western flank of the Gothic Line facing France. The fourth RSI division, the 1st Italian "Italia" Infantry Division, was attached to the German 14th Army in a sector of the Apennine Mountains thought least likely to be attacked. The RSI military was under the command of General Alfredo Guzzoni while Field Marshal Rodolfo Graziani, the former governor-general of Italian Libya, was the RSI's Minister of Defense and commander-in-chief of the German Army Group Liguria. Mussolini, as Duce and head of state of RSI assumed supreme command over all military forces of the RSI. In February 1945, the 92nd Infantry Division again came up against RSI units. 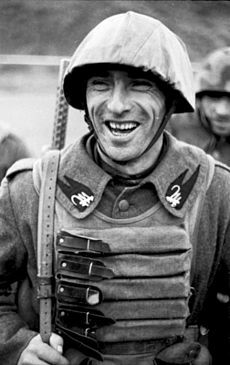 This time it was Bersaglieri of the 1st Italian "Italia" Infantry Division. The Italians successfully halted the United States division's advance. However, the situation continued to deteriorate for the Axis forces on Gothic Line. By mid-April, the final Allied offensive in Italy had led German defenses to collapse. In the end of that month, the last remaining troops of RSI were bottled up along with two Wehrmacht Divisions at Collecchio by 1st Brazilian Division being forced to surrender after some days of fighting. On 29 April, Graziani surrendered and was present at Caserta when a representative of German General Heinrich von Vietinghoff-Scheel signed the unconditional instrument of surrender for all Axis forces in Italy, but since the Allies had never recognised the RSI Graziani's signature was not required at Caserta. The surrender was to take effect on 2 May; Graziani ordered the RSI forces under his command to lay down their arms on 1 May. The National Republican Air Force (Aeronautica Nazionale Repubblicana or ANR) was the air force of Italian Social Republic and also the air unit of National Republican Army in World War II. Its tactical organization was: 3 Fighter Groups, 1 Air Torpedo Bomber Group, 1 Bomber Group and other Transport and minor units. The ANR worked closely with German Air Force (Luftwaffe) in Northern Italy, even if the Germans unsuccessfully tried to disband the ANR forcing its pilots to enlist in the Luftwaffe. In 1944, after the withdrawal of all German fighter units in the attempt to stop the increased Allied offensive on the German mainland, ANR fighter groups were left alone and heavily outnumbered to face the massive Allied air offensive over Northern Italy. In the operation time of 1944 and 1945, the ANR managed to shoot down 262 Allied aircraft with the loss of 158 in action. Little of the Regia Marina (Royal Italian Navy) joined the RSI. This was because the bulk of the Italian navy was ordered to steam to Malta at the time of the armistice, out of reach of the Germans and the RSI. The RSI's National Republican Navy (Marina Nazionale Repubblicana or MNR) only reached a twentieth the size of the co-belligerent Italian fleet. The RSI Navy largely consisted of nine motor torpedo boats (two large and seven small), dozens of MTSM small motor torpedo boats and MTM explosive motorboats. The National Republican Navy also operated fifteen CB-class midget submarines (ten in the Adriatic and five in the Black Sea) and one larger submarine, CM1. The fall of the Fascist regime in Italy and the disbandment of the MVSN saw the establishment of the Republican National Guard (Guardia Nazionale Repubblicana or GNR), the Republican Police Corps (Corpo di Polizia Repubblicana) and the emergence of the Black Brigades (brigate nere). The GNR consisted of former MVSN, carabinieri, soldiers, Italian Africa Police and others still loyal to the Fascist cause, while the Republican Police Corps was the successor agency of the Public security complex formed by the Directorate of Public Security and the Public Security Agents Corps. The Black Brigade was formed from the new fascist party members both young and old. Both units fought alongside Nazi and Schutzstaffel (SS) counterparts in an extensive anti-partisan war. The Black Brigades committed many atrocities in their fight against the Italian resistance movement and political enemies. On 15 August 1944, the GNR became a part of the Army. While the RSI supported Nazi Germany, it allowed the Italian Fascist movement to build a completely totalitarian state. During the preceding twenty years of Fascist association with the Savoy monarchy of the Kingdom of Italy, the Fascists had been restricted in some of their actions by the monarchy. The formation of the RSI allowed Mussolini to at last be the official head of an Italian state and it allowed the Fascists to return to their earlier republican stances. Most prominent figures of post-war Italian far-right politics (parliamentary or extraparliamentary) were in some way associated with the experience of the RSI. Among them were Filippo Anfuso, Pino Romualdi, Rodolfo Graziani, Junio Valerio Borghese, Licio Gelli and Giorgio Almirante. A number of postage stamps were issued by the Republic of Salò. Initially, existing Italian issues were overprinted with a fasces, or the initials "G.N.R." for the Republican National Guard. Later the government designed and printed three series, all of which are very common. Banknotes in 50, 100, 500, and 1000 lire denomination were printed by the Republic. As issuer the country was not mentioned on them, only the Bank of Italy. Pier Paolo Pasolini's 1975 film Salò, or the 120 Days of Sodom is an adaptation of Marquis de Sade's The 120 Days of Sodom, set in the Republic of Salò instead of 18th century France. It uses the source material as an allegory; the atrocities in the movie did not actually happen, while most of the choices of milieus, clothing, uniforms, weapons and other details are historically correct. Roberto Benigni's 1997 Life is Beautiful is also set in the Republic of Salò. Bernardo Bertolucci's 1976 Novecento set his story in Emilia, being at the time a province of the Italian Social Republic, even though this is never mentioned in the movie. Wild Blood tells the true story of the Fascist film stars Luisa Ferida and Osvaldo Valenti and their support for the Republic. ^ a b c Shirer, William (1960). The Rise and Fall of the Third Reich. New York City: Simon & Schuster. ISBN 0-671-72868-7. ^ a b c Dr Susan Zuccotti, Furio Colombo. The Italians and the Holocaust: Persecution, Rescue, and Survival. University of Nebraska Press paperback edition. University of Nebraska Press, 1996. P. 148. ^ Di Michele, Vincenzo (2015). The Last Secret of Mussolini. Il Cerchio. ISBN 978-8884744227. ^ Smith 1983, p. 307. ^ Giuseppe Motta. The Italian Military Governorship in South Tyrol and the Rise of Fascism. English translation edition. Edizioni Nuova Cultura, 2012. P. 104. ^ Arrigo Petacco. Tragedy Revealed: The Story of Italians from Istria, Dalmatia, and Venezia Giulia, 1943–1956. Toronto, Ontario, Canada: University of Toronto Press, 2005. P. 50. ^ a b c Jozo Tomašević. War and Revolution in Yugoslavia, 1941–1945: Occupation and Collaboration: 1941–1945: Occupation and Collaboration. Stanford University Press, 2001. P. 300. ^ Nicola Cospito; Hans Werner Neulen (1992). Salò-Berlino: l'alleanza difficile. La Repubblica Sociale Italiana nei documenti segreti del Terzo Reich. Mursia. p. 128. ISBN 88-425-1285-0. ^ a b Smith 1983, p. 312. ^ Smith 1983, p. 316. ^ a b Smith 1983, p. 317. ^ Smith 1983, pp. 317–318. ^ Petra Terhoeven, "Frauen im Widerstand: Das Beispiel der Italienischen Resistenza", Zeitschrift für Geschichtswissenschaft, 2004. 52#7 pp 608-625. ^ a b Smith 1983, p. 308. ^ Popa, Thomas A. "Po Valley 1945" WWII Campaigns, United States Army Center of Military History, 1996. ISBN 0-16-048134-1. CMH Pub 72-33. Page 23. ^ Giannasi, Andrea. "Il Brasile in guerra: la partecipazione della Força Expedicionaria Brasileira alla campagna d'Italia (1944–1945)" (in Italian) Prospettiva Editrice, 2004. ISBN 8874182848. Pages 146–48. ^ Bohmler, Rudolf "Monte Cassino: a German View" Cassell, 1964. ASIN B000MMKAYM. Chapter IX (final). Maximiano, Cesar. with Bonalume, Ricardo N. & Bujeiro, Ramiro. Brazilian Expeditionary Force in World War II. [dead link] Osprey Publishing Ltd., 2011. ISBN 9781849084833 (Print version).